(CNN) -- Launched in 1995, the Airbus A330-200 is the newest member of the European aircraft manufacturer's twinjet family. 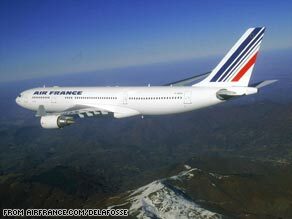 The incident involves an Air France Airbus A330-200. With a range of 12,500 km (6,750 nautical miles) and the capacity to carry 253 passengers, the A330-200 is extremely well-regarded as a medium to long-range airliner. There are 600 currently in service with 82 airlines, including Air France, worldwide. Airbus has a further 300 orders for the aircraft. According to aviation expert Kieran Daly, the A330-200 is a "reliable, ultra-modern, state-of-the-art airplane," with an impeccable safety record. He told CNN that there has only been one reported incident when an aircraft of this type has crashed. "The incident took place in 1994 before the aircraft came into service," he said. "It was being flown in test-mode by pilots who were putting it through some extreme maneuvers before it came down. "Therefore the crash was not caused by the plane itself. "It is very well-designed and well-equipped, with equally modern and reliable General Electric CF-6 engines." However, Daly said that it would take extremely violent weather conditions to cause the catastrophic failure of an aircraft of this size. "These planes are extremely robust and widely used on transatlantic routes and across Asia," he said. "They are equipped with an array of sophisticated communication equipment, so it must have been something extremely sudden to cause the loss of contact." There has also been speculation that the Paris-bound flight was struck by lightning, but that should not bring down a modern airliner, former Airbus pilot John Wiley told CNN. According to Air France, the captain of Flight AF 447 had a record of 11,000 flight hours and had already flown 1,700 hours on Airbus A330/A340 aircraft. Of the two first officers, one had flown 3,000 flight hours (800 of which on the Airbus A330/A340) and the other 6,600 (2,600 on the Airbus A330/A340). The aircraft had totaled 18,870 flight hours and went into service on 18 April 2005. Its last maintenance check in the hangar took place on 16 April 2009. The larger A330-300 aircraft from Airbus entered service in 1993 and has a capacity of up to 335 passengers. It too has an impressive safety record, despite a couple of incidents in the last 10 years. In August 2001, a Canadian airliner operated by Air Transat experienced double engine failure while traveling to Portugal. Miraculously the captain was able to perform an emergency landing in the Azores by gliding the powerless plane for almost 18 minutes. Last year, an A330-303 was forced to make an emergency landing in Australia after a sudden change in altitude injured 74 passengers. Qantas Flight 72 was flying from Singapore to the western Australian city of Perth when a sudden change of altitude caused abrasions, contusions, fractures and other injuries. The cause of the sudden drop remains under investigation.